You know those signs on the side of the road that read “We Buy Ugly Houses?” Well, here comes the digital equivalent of that: a startup called App Suey is beginning to acquire poorly-managed, barely profitable app-based businesses with the ambitious goal of eventually owning 1% of all apps in the App Store by the end of 2016. No one has ever done this before, says the company’s founder. Maybe no one has ever been crazy enough to try? The CEO and founder Arlo Gilbert said that he came to the realization that this was a business idea he wanted to test out after reading an article here on TechCrunch which stated, based on data shared by Vision Mobile, that the majority of today’s app businesses are not sustainable. At the time, Gilbert was the CEO and founder of Departing.com – a company that was serving the needs of the funeral industry. But he had no experience with that industry, and did with technology, apps and payment processing. With hundreds or even thousands of apps that are basically earning beer money (or less) for their developers, Gilbert believes the time is right to start buying them up. “After all, they are each essentially a small, self-contained micro business,” he says. Of course, owning a lot of apps also means potentially an unsustainable amount of maintenance, too. When Apple releases a new version of its operating system, or devices with new screen sizes, or new features, how could a development shop keep up with the work in updating them? Gilbert acknowledges that’s a huge task no one has ever tried before at this scale. He hopes to mitigate some of the issues using continuous integration systems combined with shared libraries in order to do large volumes of compilation more easily. And when platform-wide changes occurs, the company may need to outsource some of the work, as well. “Thankfully, we get to build the code deployment systems from day one with this in mind and build up to managing a larger portfolio, so we can learn and adjust as the portfolio gets larger,” the founder says. The idea of a secondhand market for mobile apps is not a new one. Small-time developers have taken to eBay or app marketplaces like Apptopia and Flippa to unload their poor performers. But some developers balk at listing on these sites because they don’t want to share their data for competitors to see, and don’t want to sell it to just anybody. Gilbert has been through the process of selling businesses – and apps – before. He grew his VoIP app iCall to over 15 million users then sold its patent portfolio to exit. He has bought and sold millions in domain names. And now he’s approaching this app-buying business with a million in out-of-pocket investment and $3 million in “commitments” from others who want to see the returns first. Meanwhile, he built a proprietary platform for the initial Q&A, the onboarding process and transfer for the apps he buys to be more efficient. The company has soft-launched a few days ago and already has 19 developers who have gone through the survey process. 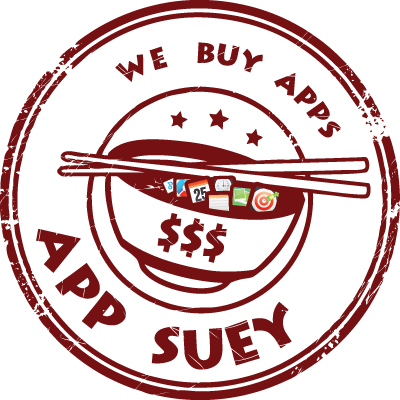 App Suey is now in negotiations and preparing to make offers on a few of those. The idea may take a bit of pocket change to get going, but there’s still the possibility that one of the many apps turns into a “home run.” When you think about it, that whole “throw a bunch of spaghetti at the wall and see what sticks” idea is not all that unlike the business model that Kevin Rose’s development shop North is now undertaking. Except instead of just buying up a bunch of apps, Rose and team are building and releasing new ones every few months to see if anything hits. The larger takeaway here may not be whether or not either of these approaches makes more sense, but that the App Store itself has become an entirely unpredictable platform on which to establish a business. If App Suey finds revenue from the fire sales and dying businesses that result from thousands of failed efforts, that would be crazy. And that’s the good kind of crazy, I guess.